Markets down; RBI policy eyed. As investors are cautious ahead of RBI policy, the benchmarking indices declined about 1 per cent on the first trading day of October series. Analysts assume the RBI will cut repo rate by 25 basis points, citing lower CPI inflation. Mumbai: As investors are cautious ahead of RBI policy, the benchmarking indices declined about 1 per cent on the first trading day of October series. Analysts assume the RBI will cut repo rate by 25 basis points, citing lower CPI inflation. 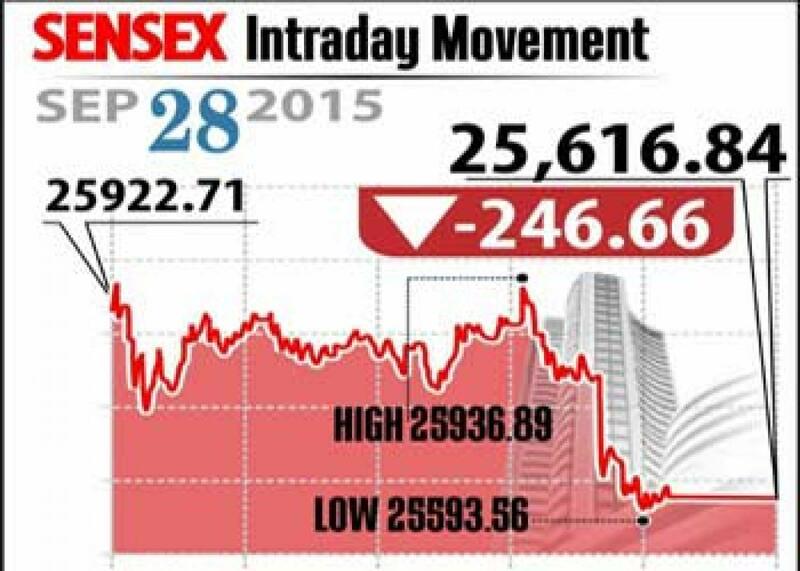 Sensex was down by 246.6 points to 25,616.84 and Nifty down 72.8 points to 7,795.70. The broader markets also declined, though less than benchmarks, midcap and smallcap indices lost 0.2 per cent each. On sectoral front, 9 out of 12 indices closed in red. Bank shares down ahead of monetary policy, as SBI and ICICI Bank closed flat. While Axis Bank down 1.3 per cent and HDFC Bank declined 0.4 per cent. Pharma stocks have mixed performance with Sun Pharama declined over 3 per cent after USFDA revoked its earlier approval to Halol plant. Dr Reddy's zoomed by over 5 per cent, the biggest gain, after the company launched Nexium generic in US market. Lupin is another gainer by over 2 per cent. Metals and mining stocks experienced selling pressure with Vedanta, Tata Steel and Coal India were down up to 4 per cent. Also, sugar stocks gained on reports that Indian Sugar Exim corporation is targeting to export 1,00,000 tonnes in the year 2015-16 to boost local prices. Bajaj Sugar, Balrampur Chini, Shree Renuka and Dhampur Sugar gained between 1 to 12 per cent. The gainers: Dr Reddy's Lab, up 5.54 per cent at Rs 4,191.85; Lupin, up 2.21 per cent at Rs 2,033.50; Hindustan Unilever, up 1.43 per cent at Rs 792.60; TCS, up 0.57 per cent at Rs 2,590.35; and SBI, up 0.17 per cent at Rs 239.55. The losers: Tata Motors, down 6.06 per cent at Rs 285.25; Vedanta, down 4.40 per cent at Rs 91.20; Sun Pharma, down 3.42 per cent at Rs 860.80; Infosys, down 2.91 per cent at Rs 1,108.20; and Coal India, down 2.81 per cent at Rs 309.65.